HO-LY balls, it’s my 100th post!!! For my first post, check this out! I had to bring back the gween, btw. WTF are you doing still doing here? 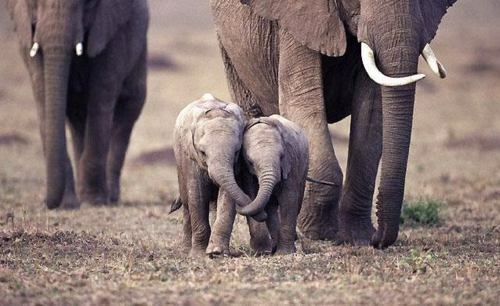 Whatever brought you to my space, I thank you for being here and sharing part of your day with me. Please let me know who you are in the comments! 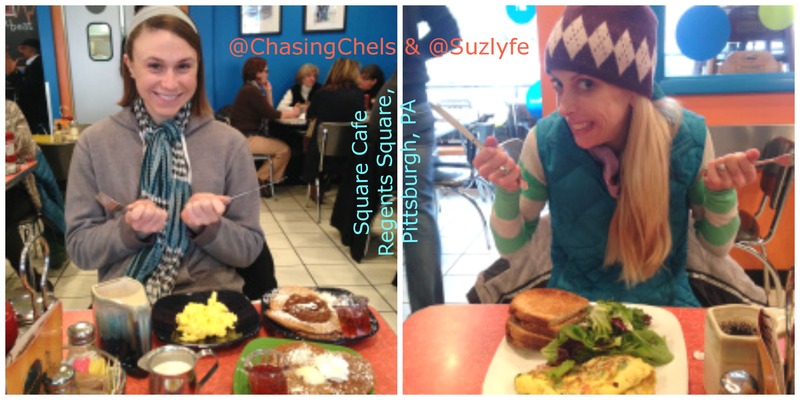 In celebration of the auspicious occasion, I finally bring you the food portion of the epic Suzlyfe-ChasingChels Take Pittsburgh saga. (For Part I, Part II) After this I promise to only wax poetic about 60+ of the best hours of my life only once a week. Maaayyybe. Thank you Jenn for giving us yet another opportunity to explore, celebrate, and discover new flavors and culinary inspiration! Let me say something, y’all: Caitlin’s boy Joe can cook. Even his leftovers are bomb.com. First night was beef bourguignon from the weekend and freshly made ricotta gnocchi with sundried tomato sauce (the sauce was Whole Foods, but still good). I honestly don’t know how I don’t have a picture of this. I was 100% sure that I did. Harrumpf. After dinner, we got to work on the gift that keeps on giving: Jeni’s recipe salted caramel ice cream. It reminded me a bit of an episode of Chopped, mostly because we had to figure out making caramel from scratch without burning it. Tis true, caramel goes from awesome to burned very quickly. Oh, Wednesday, soooooo much glory. Starting with Square Cafe. What an adorable restaurant. I got a veggie omelet literally the size of my face and demolished it (it took some time, but it got done). Caitlin dabbled in the egg party with a scrambled of her own, but when the pancake route with a fig compote vegan pancake and a pumpkin pancake. The vegan pancake was a bit chewy and the fig very rich, but overall everything got thumbs way up. At the East End Co-op, we explored for an obscenely long time and had way to much fun. Whole Foods brought us a hot bar extravaganza. You’ve seen that before. In Squirrel Hill, we picked up a garlic parmesan baguette from Allegro Hearth bakery (also, samples of chocolate cherry bread, which was delicious) and hummus from the Greek shop (sorry I didn’t get the name). Oh, and I climbed into several candy bins at The Chocolate Moose. 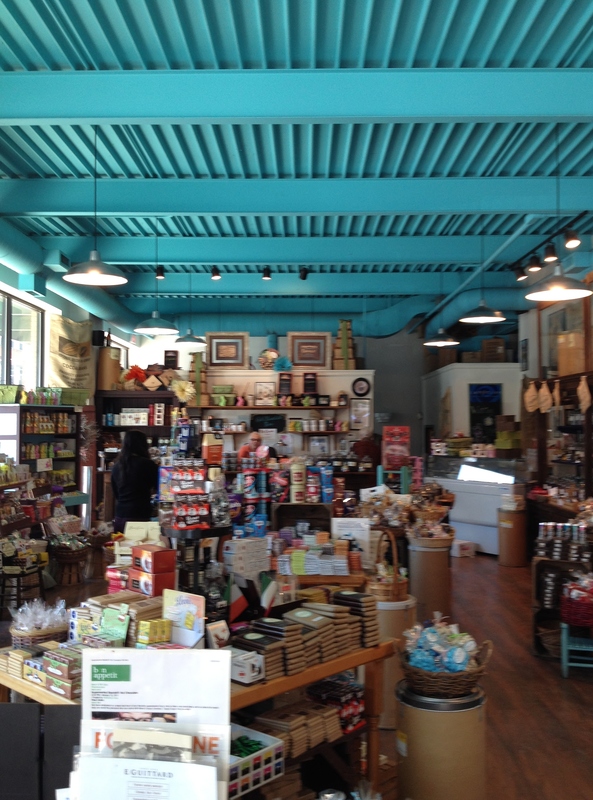 Big Dog coffee shop was so quaint and cozy–I would definitely work there all the time if I was in the area. It is totally up my alley aesthetically: a converted rowhouse or store with high ceilings, warm wood floors, a fireplace, and fresh artisan libations. We mozied over to Toast for dinner and had way too much trouble figuring out what to order for dinner. Caitlin got a white wine (a Sauvignon blanc, I believe? ), I went with a Barbera, and Joe got a bourbon based cocktail. I made the executive decision to get a picked vegetable and assorted olives app, which was simple and simply delicious (and unphotographed… we were hungry). Also, fresh, pillowy soft herb bread came out. Also demolishes sans photo. NOT SORRY. For our mains, Caitlin got the sweet potato falafel sandwich, which came with some super tasty kettle crisps. The falafel themselves were light, airy, and moist with the sweet potato soft but defiantly there. I agree with Joe that they were a little heavy on cumin, but still absolutely a treat. Joe got the oven roasted chicken. And I got a smoked salmon pizza. The crust was delicious and airy with great char from the oven. It came out a bit different from what I had expected (I had thought it would be a flat bread with chilled smoke salmon and such), and though the flavor was really great, the cream cheese and roasted salmon made it a bit rich for my taste. 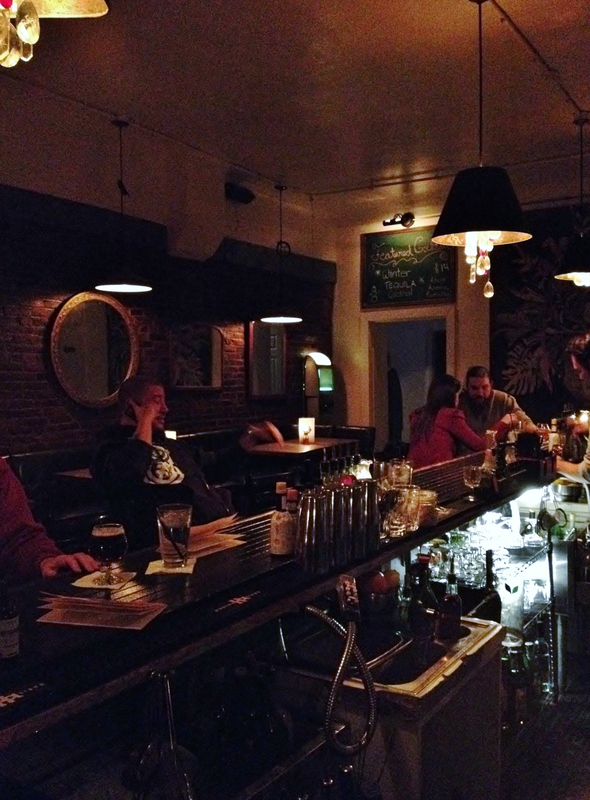 After dinner, we went to Acacia, a Prohibition-style bar that specializes in whiskeys/bourbons and legit decor. Moscow Mules and Luc Duque’s all around. The MM was so refreshing and I was honestly a bit jealous. The Luc Duque was straight up alcohol–delicious alcohol, but pretty darn strong. I let Joe take it home for me. I am a charitable soul, after all. We may have been full, but not too full to get involved in some salted caramel ice cream. We breakfasted at Caitlin’s Thursday morning. I am a master at cooking old-fashioned egg-white oats in the microwave. Just sayin. 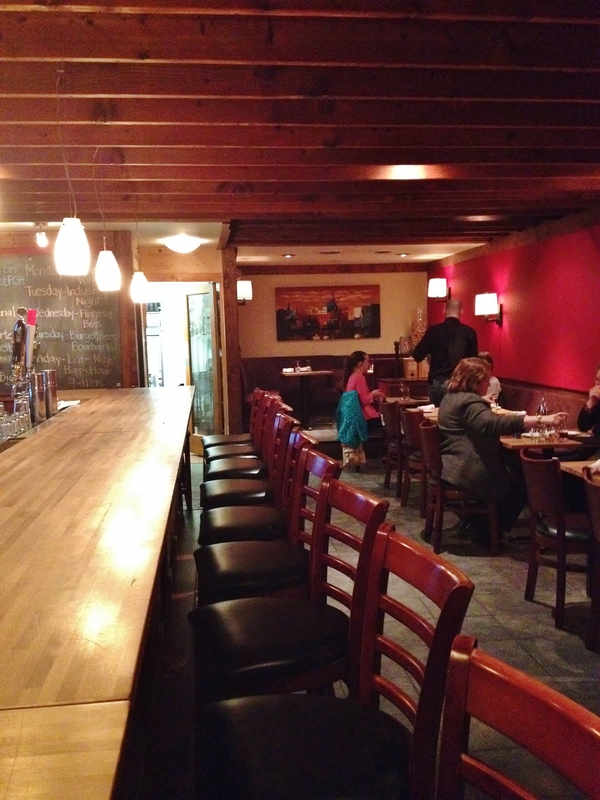 After we traipsed around UPitt, we headed over to Lawrenceville. La Gourmandine Bakery smelled like heaven and tasted like heaven. The fig bread (hey, there were samples!) was the culprit of the smell and taste sensation, to the point that it was necessary to take some home. And, while we were at it, to add a pastry: brioche filled with raspberry jam, dipped in almond syrup, and sprinkled with almond slivers. Between this and the fig bread, the car smelled like a French bakery. I wanted to bottle that upppppp. Mon Aimee chocolates almost sent me into fits of simultaneous agony and ecstasy. I wanted allofthethings. We stood tall and walked away, but were sorely tempted. At Pittsburgh Public Market, after making our rounds and buying cheese, we found the legendary boozy cupcakes (consumed after dinner). 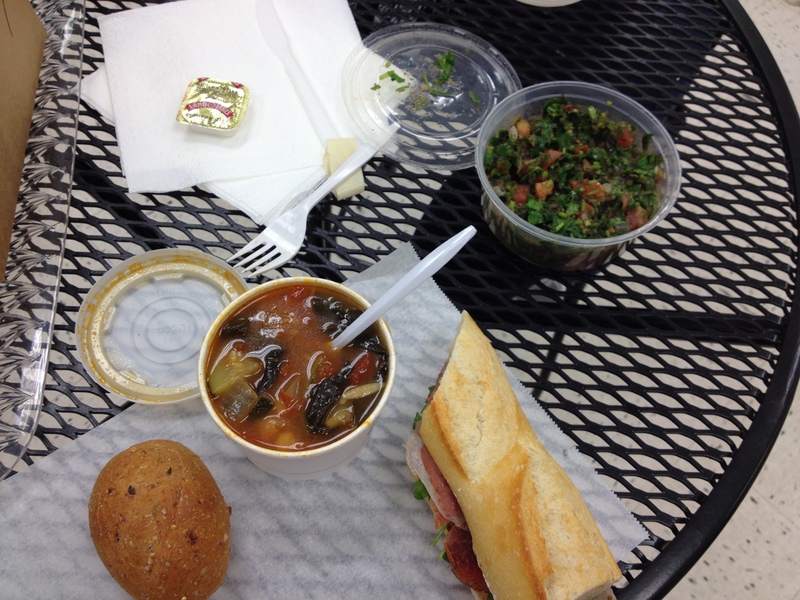 For lunch, I picked up some bulghur-less tabbouleh, we got some really solid chickpea and orzo soup, and we shared a freshly shaved prosciutto, whole grain mustard, arugula, and Four Acre cheese sandwich on a fresh baguette. Good lord that ish was delightful. Even though it took fooooorrreevver because the vendor was training someone and also moved at the speed of a dead turtle. But worth it. On our way out of the the Strip, we stopped for popcorn samples at Pittsburgh Popcorn. I had to try the Rice Krispie flavor, but it was over-sweet because of the amount of white chocolate. Had it been a drizzle, it would have been right on. The Chocolate Peanut butter was obviously delicious, but the standout was the orange pepper–sweet and slightly savory. 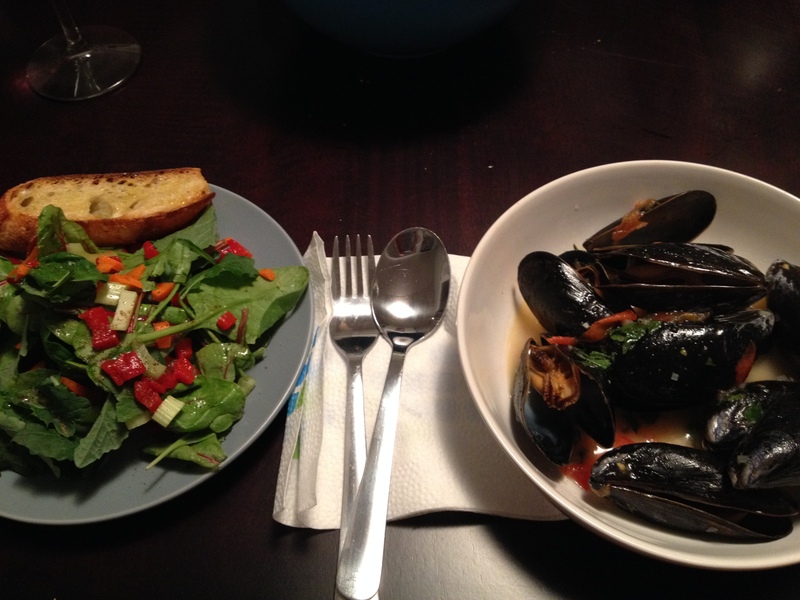 Dinner that night was wine-wine steamed mussels with cherry tomatoes, shallots, and basil (made by Chef Joe) with the toasted garlic parm baguette and a simple salad of power greens, roasted red pepper, carrots, celery, and tomato. HOLY BALLS I could’ve bathed in it. Plus, the house smelled like garlic, sauvignon blanc, and basil. 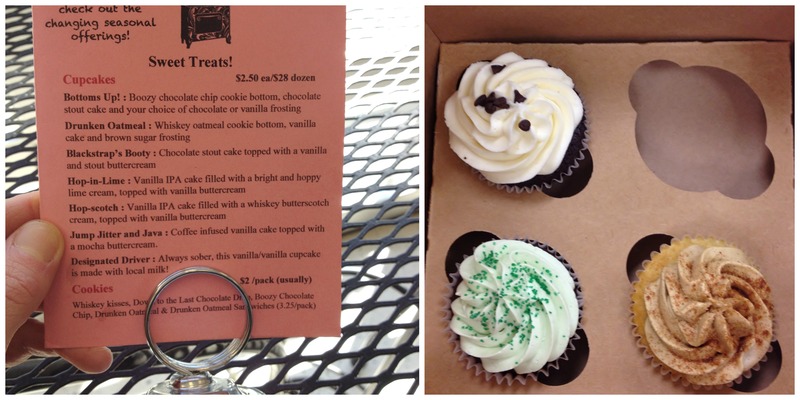 We were all awaiting the boozy cupcakes, though. And, to be honest, they were a little bit of a let-down. Blackstrap’s Booty, Drunken Oatmeal, and Pittsburgh Irish Car bomb. With a side of salted caramel. AWESOME SAUCE. The Car bomb was definitely the most booze-forward, and had a fantastic stout finish. The Blackstrap wasn’t that impressive to me, though I enjoyed the chocolate chips at the bottom. And the Drunken Oatmeal was solid. The biggest issue facing these cupcakes was the lack of moisture. Once Eliza (the baker) figures that out, she will have a great product. But kudos to her for her creativity and dedication to using local ingredients, brews and making absolutely everything herself. 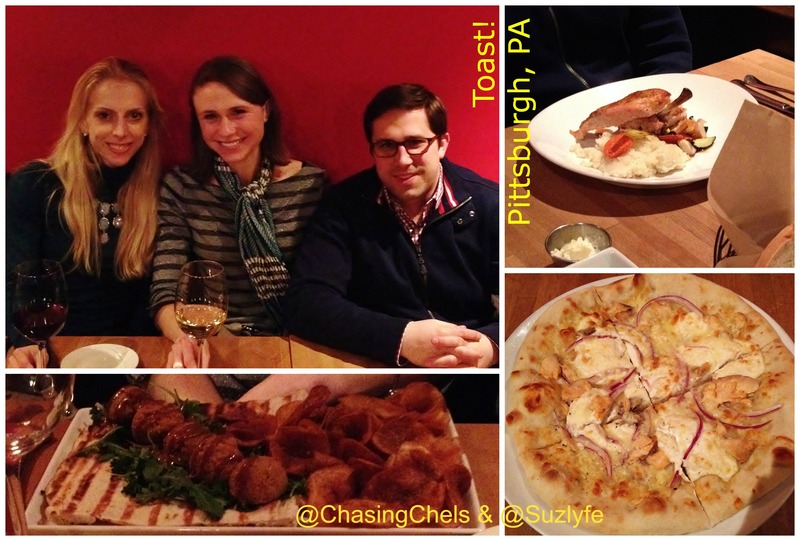 As you can see, we ate a lot in Pittsburgh. Snacks were also had (I owe her a box of Girl Scout Cookies at this point), so don’t give us crap on that, but I wanted to highlight the amazing offerings of the Steel City and the Caitlin-Joe household. I miss those treats, but mostly? I miss just spending all day with my friend. We are currently planning a C-city road trip: Chicago, Charlottesville, and Charleston. WHO IS IN??? Have you been to Pittsburgh? What was the last amazing thing that you ate or made? 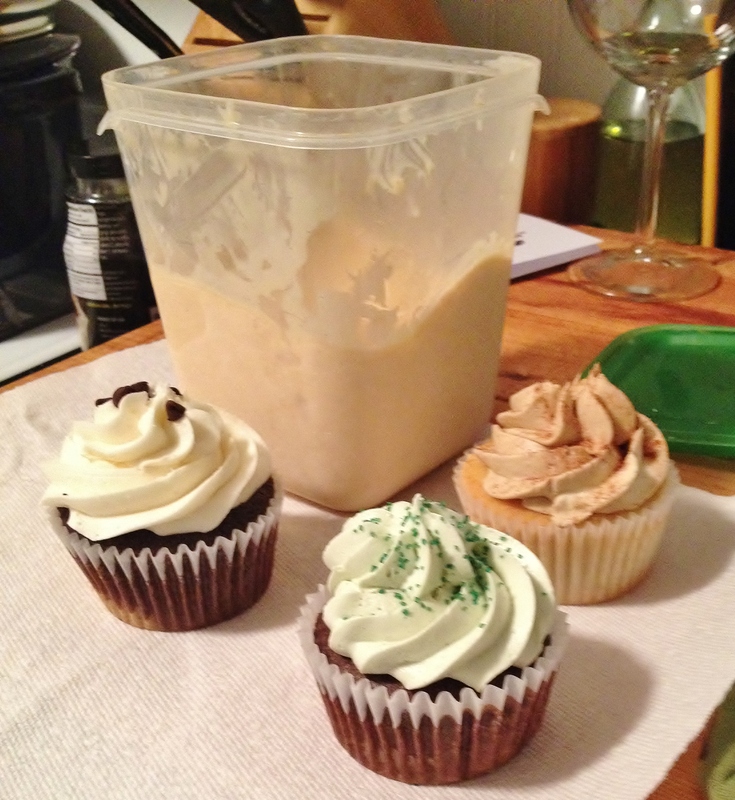 Have you had a boozy cupcake?